Medieval English Drama provides a fresh introduction to the dramatic and festive practices of England in the late Middle Ages. The book places particular emphasis on the importance of the performance contexts of these events, bringing to life a period before permanent theatre buildings when performances took place in a wide variety of locations and had to fight to attract and maintain the attention of an audience. Showing the interplay between dramatic and everyday life, the book covers performances in convents, churches, parishes, street processions and parades, and in particular distinguishes between modes of outdoor and indoor performance. 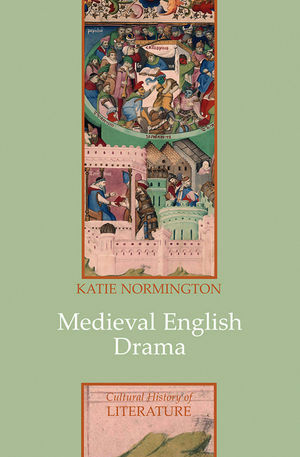 Katie Normington aids the reader to a fuller understanding of these early English dramatic practices by explaining the significance of the place of performance, the particularities of spectatorship for each event and how the conventions of the form of drama were manipulated to address its reception. Audiences considered range from cloistered members, congregations and parish members to urban citizens, nobles and royalty. Undergraduate students of literature of this period will find this an approachable and illuminating guide. 1. Drama of Enclosure: Convent Drama. 2. Drama of Inclusion: Church and Parish. 3. Drama and the City: City Parades. 4. Drama in the City: Processional Drama and Hybridity. 5. Fixed Place Drama: Place-and-Scaffold. 6. Indoor Drama: Private Entertainment. "A cogent and thoughtful introduction to a diverse and complex topic. Normington writes with great authority and digests difficult concepts, theories and historical peculiarities neatly and to useful effect." "An accessible introduction to the field was missing until now. Katie Normington's excellent book is fully aware of the astonishing variety and ubiquity of drama within the period. The book's great advantage is that it never loses sight of its own focus on a primary student audience." "Katie Normington's energetic and comprehensive book is one of the most accessible studies of early drama to date. Reassessing the previous division of plays according to genre, it argues for a greatly expanded notion of medieval dramatic activity: one that embraces processions, public interments and punishment parades, besides urban Biblical plays and private household performances. With its emphasis on audience response and the role of women, this is an indispensable introduction to the variety and cultural importance of early English drama." "Drawing upon a wide array of evidence and performative practice, Kate Normington's Medieval English Drama: Performance and Spectatorship provides a valuable introduction to the myriad performance contexts of early modern drama, skillfully exploring their implications for medieval audiences as well as modern readers, critics, and performers. Undergraduates, graduates, and teachers will find her book a thought-provoking compendium of relationships between space, individual performance events, cultural contexts, and diverse audiences." "With its broad span, short sections, and clear writing, this book valuably introduces the modern student to the increasingly important nexus in early drama studies between performance location and spectatorship." Fresh introduction to the dramatic and festive practices of England in the late Middle Ages. Covers a wide range of canonical and lesser known dramatic practices, with an emphasis on their social and cultural historical contexts. Highlights the importance of the performance contexts of these events to bring to life a period before permanent theatre buildings. Shows the intersection between performance and everyday life, illustrating the range of audience members, from cloistered member to urban citizens and royalty.